SEAT continues its “Why not now?” campaign for the new Tarraco with a new advert. 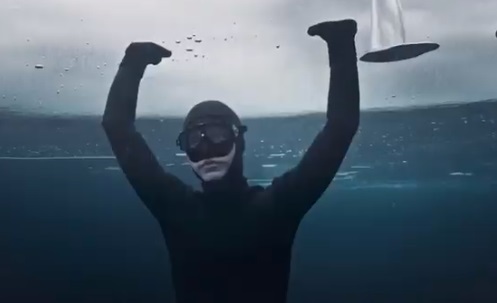 The spot features a woman dressed in a black wet suit walking through a forest and on an icy lake in search of a the right spot to crack the ice open and dive into the water. Onscreen lines like “too wild,” “too scary,” “too far,” “too hard,” represent excuses that many other people would have used so that they wouldn’t do what she does, while in the background the song “Try” by Bugge Wesseltoft & Sidsel Endresen, from the 2002 album “Out Here. In There,” is playing. “You don’t stop because you get older. You get older because you stop. The new SEAT Tarraco. Why not now?” onscreen lines read at the end of the advert, which also sees the new Tarraco SUV driving down a snow-covered forest road. A previous installment in the “Why Not Now?” series featured a surfer and a drummer who made a switch for one day. The spot followed the two throughout the day as they used the new Tarraco and enjoyed its features, including the SEAT digital cockpit with navigation system, the top view camera and Park Assist, the spacious trunk and folding rear seats, the virtual pedal, the BeatsAudio system, the wireless charger, and more. The new SEAT Tarraco, which features at the front a more prominent grille design and LED headlights set further into the body, comes with seven seats as standard, sliding rear seats in the second row and folding seats. According to the automaker, the interior “exudes a level of quality normally found in the premium sector, mixing different materials to evoke a feeling of confidence no matter which trim level is chosen and which specification is selected”. The Tarraco range includes Tarraco SE, Tarraco SE TECHNOLOGY, Tarraco SE FIRST EDITION, Tarraco XCELLENCE, Tarraco XCELLENCE LUX, Tarraco XCELLENCE FIRST EDITION, and Tarraco XCELLENCE FIRST EDITION PLUS.